At our second annual conference, we are proud to bring international keynote speakers, father of the movement, Dr. Frank Ascione (Safe Haven For Pets) USA, Allie Phillips ( SAF-T and TASK) USA and the Links Group Scotland, Dr. Freda Scott-Park to speak about how the movement has grown and changed abroad. This year our focus is on how to turn theory into practice and increase the front line service support for animals and their human carers seeking refuge and recovery from domestic violence. We will look at successful strategies, solutions to challenges and look at ways we can increase collaboration and resource share. We will take a particular focus on housing animals with their humans in refuges, the veterinarians role and supporting children traumatised by witnessing abuse toward animals/empathy programs. Some organisations have chosen the conference to launch their new ventures and research. More speakers to be announced shortly. Freda is a veterinary surgeon living and working in Scotland. She has been associated with the Links Group (a committed multi-agency interest group that promotes the welfare and safety of vulnerable children, animals and adults so that they are free from violence and abuse) since the first Links conference in November 2001. At this conference, the veterinary profession were introduced to the concept of the “battered pet” and further research and clinical evidence was presented, which suggested that there are sometimes inter-relationships commonly referred to as ‘links’, between the abuse of children, vulnerable adults and animals. During her time as President of the British Small Animal Veterinary Association and following that, as President of the British Veterinary Association, she sought to ensure that veterinary surgeons were made aware of their role in recognising animal abuse, and beyond that, the possibility of associated violence to humans in a violent home. Freda is currently Chairman of the Links Group (UK), which aims to help all members – humans and animals – of families affected by domestic abuse. The Links Group in the UK offers practical help and advice to vets and health professionals, as well as helping to make people understand why hurting humans and animals is unacceptable. He is one of the most prolific and well known academics and thinkers in the movement who has inspired organisations such as Lucy’s Project to form around the world. He will be speaking about recent reforms in the USA, recognising the nexus between animal abuse and domestic violence. His presentation will be of particular interest to those interested in international law. “Frank R. Ascione’s recent research examines the common roots of violence toward people and animals and is directed at identifying an early indicator of at-risk status in children. He has collaborated with human services, social work and child development staff working with abused children, with youth corrections personnel and with state shelters for women who are battered. His recent work has been supported by the American Humane Association, the Kenneth A. Scott Charitable Trust and the Geraldine R. Dodge Foundation. Ascione has provided information or testimony for the state legislatures of Utah, Ohio, Colorado, Tennessee and Washington regarding cruelty to animals legislation. He has appeared on CNN’s Live from the Headlines and The Oprah Winfrey Show, had his research cited in the New York Times, USA Todayand Oprah Winfrey’s magazine, O, and has been a guest on numerous local, national, and international TV and radio programs. A member of the American Psychological Association, the International Society for the Prevention of Child Abuse and Neglect, the American Professional Society on the Abuse of Children, the International Society on Anthrozoology and the Society for Research on Child Development, Ascione serves on the Child and Animal Abuse Prevention Advisory Council of the Latham Foundation. Dr. Frank Ascione will be speaking on law reform in the USA and recent changes which have affected animal protection from domestic violence. Known as a compelling and fascinating speaker and one of the longest standing voices of the movement, this presentation may be of particular interest to politicians, legal practitioners and advocates. Award winning author of Defending the Defenseless: A Guide to Protecting and Advocating for Pets and How Shelter Pets are Brokered for Experimentation: Understanding Pound Seizure. Allie will be giving two presentations- she will speak about SAF-T and TASK. Allie Phillips (SAF-T) has developed the first global initiative guiding domestic violence shelters on how to house companion animals with their humans. Phillips has developed a training manual and a passion for helping others around the world house animals and human victims safely together. Her presentation will be of special interest to anyone involved in the running or management of a shelter. Dr. Freda Scott Park of the Links Group UK, will be speaking about developments in both the UK and the EU and the actions occurring within those areas to recognise animal victims of domestic violence. Her presentation will be of particular interest to anyone interested in veterinary sciences, international law and the international movement. This year we are grateful to the RSPCA NSW for their support in promoting the event. We look forward to hearing them speak on their Safe Beds for Pets program. Nik Taylor, Tania Signal and Heather Fraser, Flinders University, “On the Margins-Taking the link to new grounds” a fascinating intersectional approach to the link between DV and animal abuse and its growth as a movement. Anna Ludvik, founder of Lucy’s Project on the development of the Australian movement. Police Domestic Violence Liaison Officers. 9.30-10.00- Anna and Lydia of Lucy’s Project- Introduction and welcome. 11.30-11.50 AJP The Hon. Mark Pearson MLC, The Animal Justice Party policy on Domestic Violence and Animal Abuse. 11.50-12.45- Allie Phillips “Sheltering Animals & Families Together (SAF-T) ™: A Global Initiative that Saves Lives”. 4.45- 5.00 – Wrap up. Saturday night dinner from 6.00pm at Bodhi. 9.45-10- 00am Ingrid Reilly, NSW Police Domestic Violence Liaison officer. 10.00-10.30am Matt French, “NSW RSPCA- Safe Beds for Pets Program”. 10.30-11.00- Jenny Jackson, CEO EDVOS “Pets in Peril program report”. 11.00-11.20 Glyn Scott., founder, “Peace Love and Gratitude, Shelter for Animals and Pets”. 11.40-12.10- Dr. Lydia Tong, Forensic Veterinary Pathologist, Researcher and Vice President of Lucy’s Project. 12.10- 12.40- Richard Wainright and Lisa Craig, Peel Legal Centre, WA,“My Saving Grace” project report. 1.50-2.20 Tania Signal and Nik Taylor “Taking the Link to new ground”. 3.10-4.10 Open discussion Information sharing – Introduce your organisation and project, ask questions of other organisations. The nearest train station is Wynyard. Take the York street exit, turn left out of the station, turn left at the lights, walk down to Kent street, turn right and Portside Centre is on the left hand side of the road in the Symantec building. Entry will be marked. Two hotels within short walking distance of the conference have been kind enough to offer us a discount during the conference, Travelodge Wynyard and Amora Hotel Jamison Sydney. – All rooms required will be strictly subject to availability. Should the Deluxe rooms be sold out other room types will be quoted at the Best Available Rate of the Day. – All bookings much be secured with a valid credit card taken at the time of booking. Payment for all rooms will be up to the individual responsible for that booking. – Any rooms cancelled within 24 hours of arrival will be charged a one night penalty fee. Discounted Room Only Rate: 10% off the hotel’s best avaliable, room only rate – this discount cannot be used in conjunction with any other offers. Buffet Breakfast Rate: If you wish to pre-book the hotel is happy to extend a discounted rate of $18.00 per person/per day. Promotion Code: Lucy’s Project – To avail yourself of the special rate, please ensure you quote this reference when contacting the hotel. Method of Booking – Please contact the hotel directly via phone or email (details as below) – this rate only applies to bookings made direct with Travelodge Wynyard . Cancellation Policy – A 72 hour cancellation policy will apply to each booking, should guests wish to cancel or amend within this time fees will apply. Payment – You will be asked to provide a credit-card to secure the reservation upon making the booking, full payment will then be required upon check-in. NOTE: As no rooms are physically held, the above discount is purely subject to availability and cannot be guaranteed. Contact the Travelodge Wynyard as soon as possible to assure your booking. Click here to contact the Travelodge Wynyard. The conference will approach complex issues from a range of perspectives including human-animal crisis services, vets and domestic violence, challenges faced by rural and remote Australians, children and animal abuse, the role of veterinary forensics and empathy and anti-violence education programs. There will also be the presentation of results from current research projects, talks from invited speakers and discussion and focus groups on a range of topical subjects. Meet, network, share and learn from professionals, academics, students and other people working in this area from across the country. For many families, pets are as much a part of the family as any other human member. Often the only source of comfort to an abused child or adult, a victim will not leave a violent home whilst knowing the animal is left defenseless. Often the perpetrator of violence knows that to hurt the animal is to hurt the victims themselves, using the animal as a form of psychological abuse or means to control the victim. Without a safe place to take the animal, there is no end to the cycles of violence. Local shelters play a vital part in breaking the cycle and without them, many more animals, children and adults would be at risk of enduring further violence. Lucy’s Project recognizes that many human victims of domestic violence will not leave their homes until they know their animals will be safe from harm. Animal Rights and Rescue in Lismore offers a safe place for animals in need, many victims of domestic violence. Working with local organisations, ARRG is often called upon to find safe homes for animals in danger. Without ARRG, many animals would have nowhere to go. See their website, www.animalrights.org.au for more information about their work. 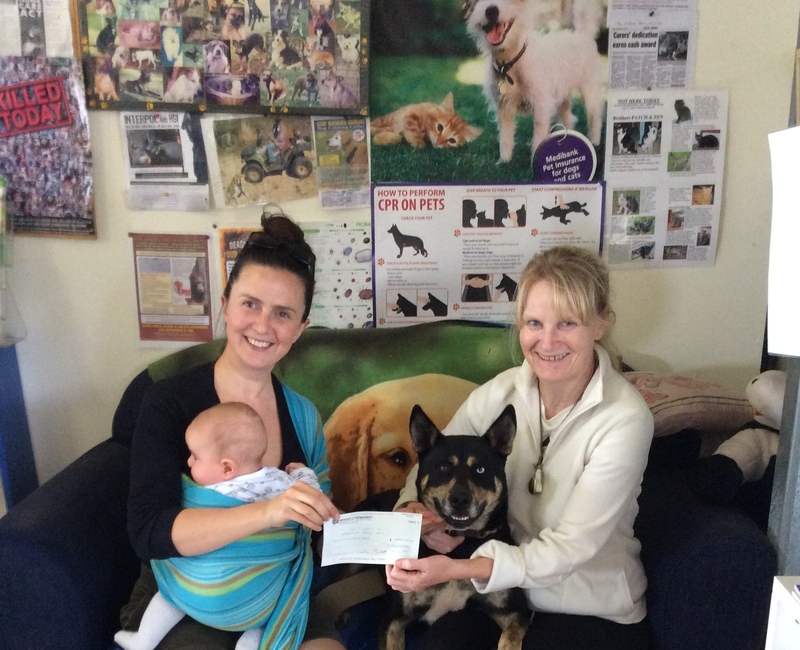 We are proud to have raised $1300 for ARRG through Lucy’s First Birthday Appeal. Thank you to all who have contributed.